Fashion Maven... Mommy: VOTE FOR MEEEEE!!!! The contest lasts for 5 weeks. Each week a new challenge will be posted! You can vote once a day, every week day. Please note that on Fridays, voting closes at 11:59 am... so basically please be sure to vote in the morning on Fridays. Every time you vote, you are automatically entered to win some awesome prizes from Allure!!! Sharing is caring right? 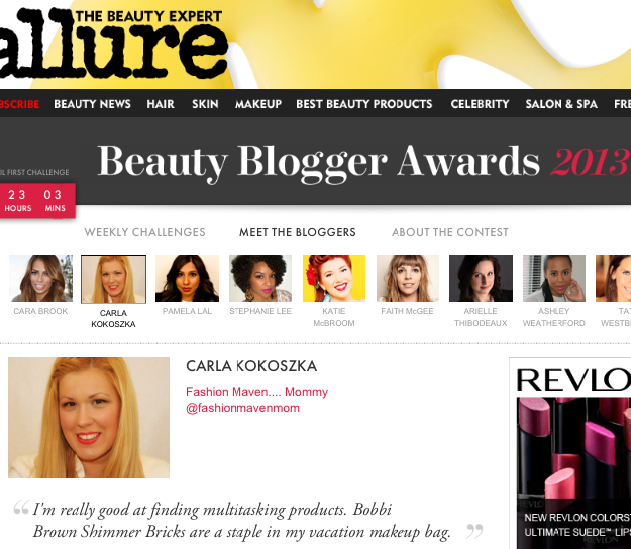 On my profile page on Allure, you'll find social icons for Facebook and Twitter. Please click on those to share with your friends and family! Perhaps they can vote too! There are many wonderful surprises in store, so be sure to check back often so that you don't miss out! THANK YOU, THANK YOU, THANK YOU... for your continued support! OK, so i thought it'd be fun to post my intro video as well as my interview from Allure. Enjoy! Interview from Allure: My Story! Some people might compare Carla Kokoszka's makeup collection to an episode of Hoarders. "In the last year, I went through three train cases," says Kokoszka. "The most recent one I have is almost my height. It's not normal." But to Kokoszka, a preschool teacher with 5-year-old twins in New Jersey, beauty is a source of relaxation. "The half hour I spend in the morning putting on makeup and watching the Today show is me time," she says. Now, the 38-year-old uses her blog, Fashion Maven.... Mommy, to help other women feel glamorous. For Kokoszka, it serves a higher purpose. "For a long time, I felt like I was missing something," says Kokoszka, who worked in fashion before pursuing a career in early education. "And it dawned on me: I can blog and be creative and do whatever I want to do. From that moment on, I've felt fulfilled." Q. What was your first makeup purchase? A. "It was Nylon from M.A.C., which has been a staple in my eyeshadow repertoire since I was 16." Q. What are your vacation must-haves? A. "I'm really good at finding multitasking products. Bobbi Brown Shimmer Bricks are a staple in my vacation makeup bag." Q. What's the best beauty innovation you've seen recently? A. "The Clarisonic Mia 2. I'm obsessed with makeup, but I don't love taking it off. I keep it in my shower, and I never skip a day." Q. Have you ever had a hair disaster? A. "I dyed my hair blue-black when I was 14. What was I thinking? My parents were pretty shocked when they saw me." Q. Do your twin daughters share your love of beauty? A. "They especially love nail polish. I have a massive collection, and they love to pick out a new color to paint their nails." Q. Do you have a favorite TV show? A. "I'm going to sound cliché, but I die for The Rachel Zoe Project. I live vicariously through her in every episode.."
A. "I was a wedding singer for seven years. My dad was in a band, and they needed a female singer. I'm probably in a lot of people's wedding videos." Your interview came off so well! I will absolutely be voting for you tomorrow. I hope that you win it! I'm rooting for you girl!!!!! awe so amazing and exciting! i hope you win, and cant wait to vote and follow! xO!